After raids at Gorkha Janmukti Morcha chief Bimal Gurung's office, the group has announced an indefinite shutdown in Darjeeling. 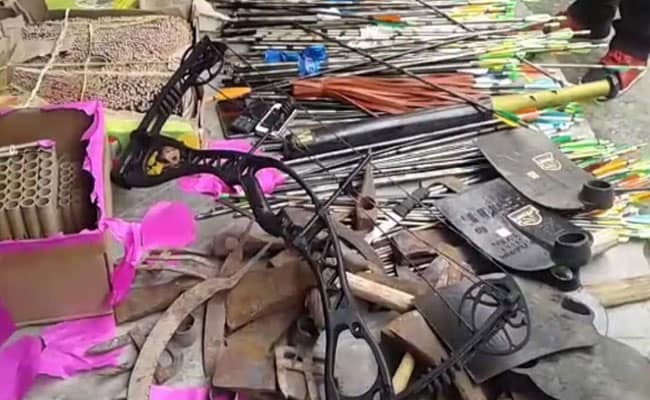 Darjeeling: Arrows, knives and a machete were seized when the police in Darjeeling this morning raided Bimal Gurung, the chief of the Gorkha Janmukti Morcha that is leading protests to demand a separate Gorkhaland. A leader of the group, Karuna Gurung, was arrested. Police in riot gear surrounded the office of the Morcha this morning and were seen bringing out a stacks of bows and arrows; the office, which also serves as Mr Gurung's home, was deserted but the only Morcha leader who responded the calls from the media justified the cache of traditional weapons. "We are tribals and about to hold our traditional archery competition... they showed our traditional equipment as weapons," said Benoy Tamang. "This is why we need Gorkhaland, our rights, our culture, our heritage, our traditions... nothing is respected," he wrote on WhatsApp. The raids telegraphed that West Bengal Chief Minister Mamata Banerjee is ready to up the ante against the Morcha and its agitation in the popular hill town and her patience is wearing thin. In peak tourist season, the protests have forced many to abandon their holiday and leave the picturesque town. The protests that were triggered by fears that the state government was imposing a Bengali-only rule on schools in Darjeeling - where the majority of the population speaks Nepali - have escalated over the past week. The group has announced an indefinite strike and most of its leaders have gone underground. A large number of police and security personnel were seen today at the Morcha's addresses, including the Kanchenjunga Stadium where it holds its meetings. Earlier this week, protesters vandalised government offices in Darjeeling as part of the Morcha's call for a shutdown. On Tuesday, there were clashes in which the police used batons on protesters. The Gorkha Janmukti Morcha controls the Gorkhaland Territorial Administration or GTA. According to news agency PTI, the centre is closely monitoring the situation in the hill district and has offered all assistance to the West Bengal government.